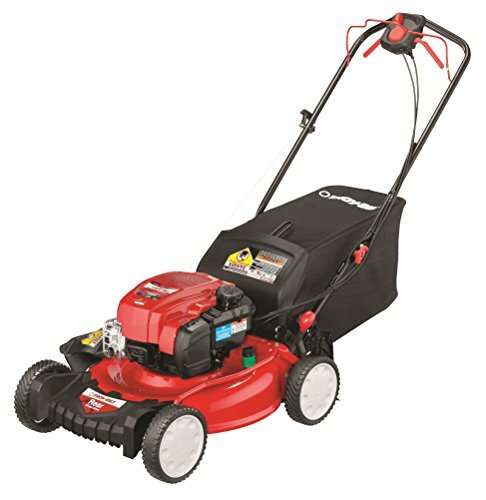 A gas powered walk-behind mower can offer some significant power. Which is nice if you have a lawn with thick grass like Kentucky bluegrass, or you find yourself frequently having to mow when the grass is still a little bit damp after a passing rain shower. Of course, the downside to all this power is that the motor, frame, and deck tend to be a little heavy. 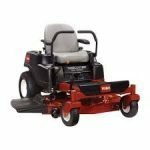 If you have a large yard, or you simply aren’t in youthful great shape, pushing one of these mowers can wear you down to the point that you lament mowing. Fortunately, thoughtful manufacturers like Troy-Bilt understand this dilemma and offer self-propelled gas-powered lawn mowers. The drive system in the rear wheels transfers a modest amount of power from the stout 163cc Briggs and Stratton engine to move it forward. This gives it the grunt to handle most includes as well as rough patches in the turf. All you need to do is steer. 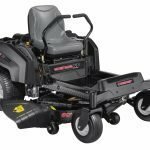 The 163cc Briggs and Stratton engine provides ample power for the mower blades as well as the self-propelled system’s four different speed settings. Just be careful with the top two speed settings as they tend to have a little pop when you first engagement them and you might even feel like you are rushing to keep up. The 1.09-quart fuel tank might be a little on the small side if you have a large lawn with a lot of wide open runs, and you like to cut at full speed. The Troy-Bilt TB330 self-propelled, gas-powered lawn mower has the strength to handle inclines and uneven ground with little to no help from you. If you have a lawn that requires a lot of turns, or you have to work around flower beds and trees, you might find yourself wrestling with the self-propelled power. The first couple of times you use it, try to keep the speed setting low, so you can develop a feel for it. Changing out between the side discharge, bagging, and the mulching system is relatively simple. The wash port and deck wash feature are especially handy for cleaning out stuck on grass clippings and other debris after you are done mowing. The Troy-Bilt TB330 has the power to eat through thick grass, even on a patch of rough turf. If you are using the bagger feature, and the bag gets too full you might end up leaving some excess thatch behind. The mulching feature on this mower if pretty good. If you have to choose between mulching and side discharge, I would suggest leaving it set for mulching. Troy-Bilt did their best to address maintenance and cleaning when they were designing the TB330. The deck includes a wash port which helps clean away grass clippings and other debris that can sometimes get stuck under the deck. The bagger has a large 1.9-bushel capacity, which is nice for reducing the number of stops you need to make to empty it out. Especially if you have a large lawn. However, if you run it to maximum capacity, it can actually be pretty heavy. So, it might be a good idea to plan your “Mowing Strategy” to bring you near the compost pile from time to time. The no oil change system is an interesting, and possibly suspicious feature. 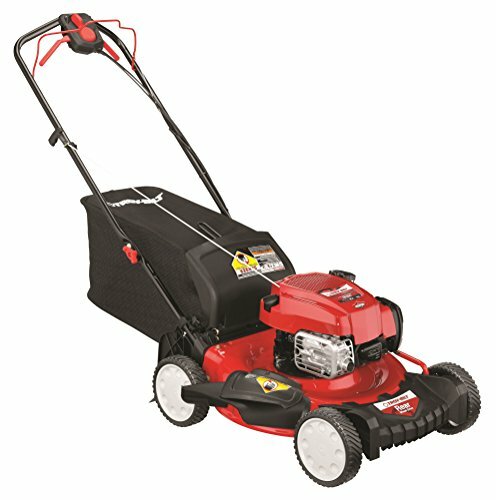 The Troy-Bilt TB330 comes with a 15 oz. bottle of SAE 30 oil. You simply pour some in, let it settle, check the oil line and add more if needed, until it’s just right. At that point, the mower is ready to go. There is absolutely no port to empty the oil for an oil change. Briggs and Stratton specifically designed the engine, this way. You simply check the oil from time to time, and if it’s running a little low, you top it up. On the one hand, it’s innovative and convenient. Still, for some of us, it can be hard to get your dad’s voice out of your head, telling you to change the oil! The handle has the basic safety stop features you will find with any walk behind lawn mower. The plastic of the levers does feel a little weak. Just bear that in mind if you need to wrestle the mower around curved edging or a flower bed. The no oil change system requires you to periodically add oil, without needing to perform a standard oil change.The TriAction cutting system makes it easy to bag, mulch or simply side discharge cut grass.The Ready Start system reads the surrounding temperature and then adjusts the fuel to air mixture for you. This helps with starting as well as overall fuel efficiency. The wash port helps clean excess grass clipping out from under the deck without making you get on your hands and knees. This is a powerful self-propelled mower which helps the Troy-Bilt TB330 cut quickly and efficiently. The Read Start system also adjusts the fuel to air mixture for added fuel economy. The 21-inch deck is also large enough to cut through large swaths of grass.